Why not start recycling your food waste and plant matter today. Start providing your garden with the best compost. Yes, we know you are wondering how to do this! 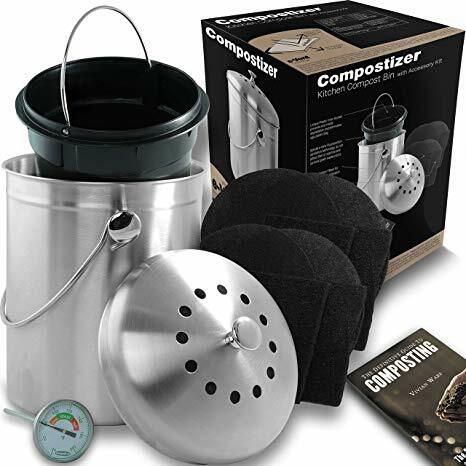 Easy, get yourself the Best Composter to use at home. With the appliance, it rids the landfills of unnecessary garbage and helps enhance the soil in the garden. 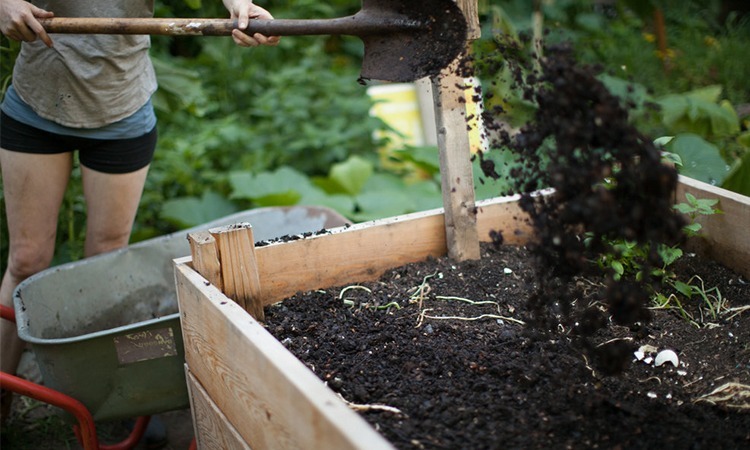 You will be surprised how your homemade compost gives veggies, flowers, and fruits the boost they need to grow. So instead of throwing the trash in a pile in the back garden using a compost bin placed in a dark environment combined with just the right moisture and oxygen. Sometimes, size matters when you have loads of waste. Maybe you live in an apartment or home with limited space and want to start an indoor herb garden. Here we have selected the Compostizer for you. So why should you consider buying this humus bin kit? Firstly, the entire container has a stainless steel construction that fits in with your kitchen décor. 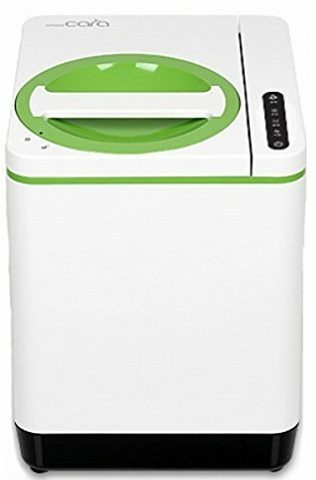 Secondly, it has an inner bucket that isolates the acidic process, eliminating the need for plastic bags and protects the bin. Thirdly, it has micro mesh e-vent technology that prevents fruit flies, roaches, and other critters causing problems in the kitchen. And most importantly, it leaves your place smell free. Included you get four double filters, but you will need a compost tumbler extra to process the compost. Here we have the Miracle-Gro, that is suitable for any small space to use. The unit fits into tight space and has dual chambers. On the one side, you add your scraps and yard waste and close the lid. Now use the built-in handle to give it a couple of turns every few days. On the inside, you have the mixing bars to provide to speed up the process. The product has a recycled polypropylene structure, BPA-free, and UV protected if you want to place it outdoors. The steel frame is galvanized to ensure longevity standing outdoors. Do you need an affordable composter? Here we have the Yimby made for low-budget users. The compost bin has two chambers. The one side is for adding scraps while the other side is for the finished compost. The fertilizer machine has a tumbler design with outstanding aeration and holds up to 37 gallons of manure. The constructions durable, but difficult to assemble and might leak compost so best to use in the garage or outside. 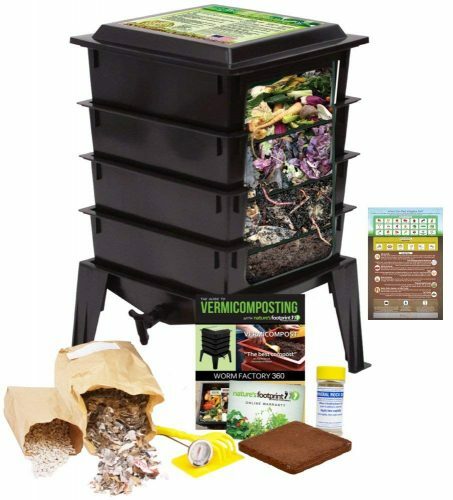 The Worm Factory from Squirm Firm is a worm fertilizer and one of the best compost bins for small yards. The unit features four trays to make different batches of manure for the garden. You can expand the container to an eight-tray one if needed. Each tray holds 13 pounds of nourishment for the garden. 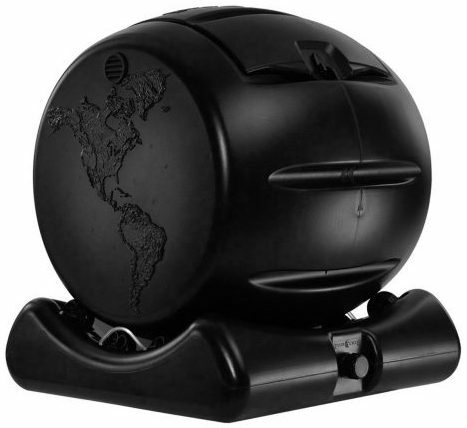 The Composter has an odorless design and perfect for using indoors and outdoors. The material is thick, maintains a constant temperature, and is easy to assemble. The biggest problem you face using this model is fruit flies, and the worms can find their way out of the bottom tray. Do you need a fertilizer bin that withstands anything outdoors? 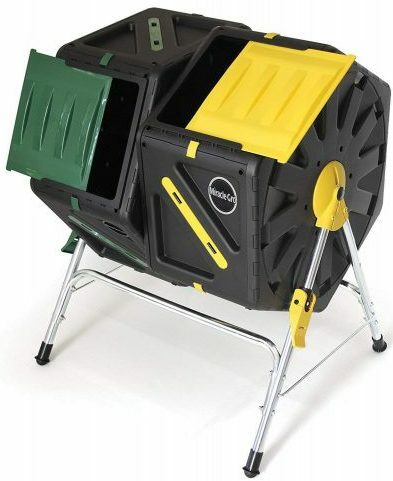 You need the Soilsaver Composter made from recycled fabric. Not only does the durable material improve it for long use, but the performance is also excellent. The structure provides insulation to keep heat in allowing microorganisms to break down faster. The compost bin has a self-watering lid you can lock to keep unwanted critters away. The product is easy to use and keeps decomposing stench inside. There are multiple sliding doors for accessing the finished manure. The problem with the unit is that there is no door at the bottom and cannot use it inside the house. 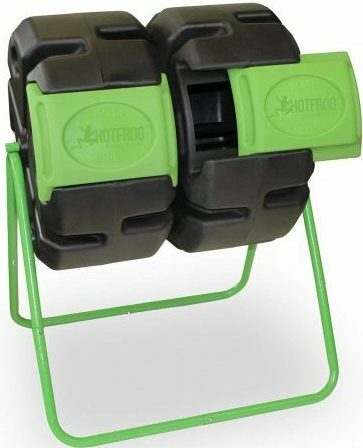 For one of the best Composters to use at home, the HOTFROG comes highly recommended. 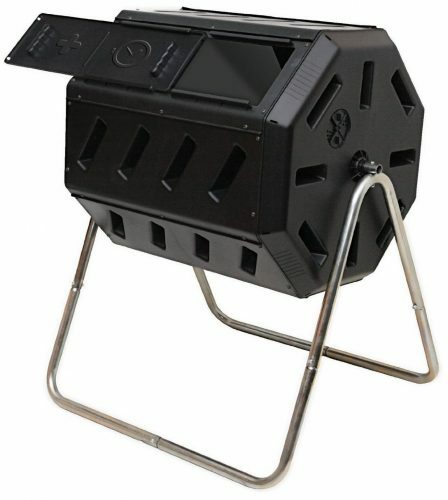 The fertilizer bin has a compact design and is easy to use. The aerations fantastic and holds up to 37 gallons of manure. Furthermore, it has a tumbler design made of recycled plastic with UV treatment. With the unique design, it looks great standing in the garden. The price ratio is great and assembling the units easy. The chambers are a bit on the small side, and it does not come with instructions on how to assemble it. No matter where you live the Envirocycle Composter you can place close to the home or in the garden. The compost bin has a tea collecting base and suitable to use on a balcony as well. 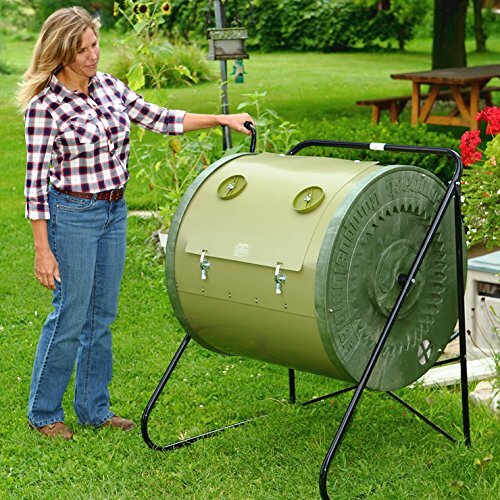 The product has a food safe and BPA-free construction, and the drum rotates on the base to make nutritious manure for the garden. The product produces compost tea. 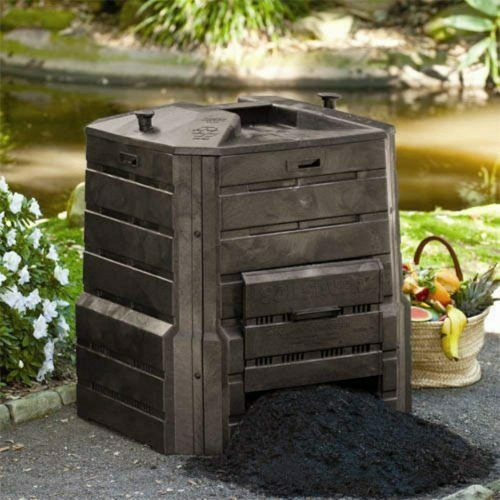 For odorless composting, you need the Mantis with its enclosed design. There are drainage vents that prevent the manure from escaping, and it has a tumbler design. With loads of air vents, it gives proper aeration to provide you with high-quality organic fertilizer. The loading capacity is 88 gallons and easy to load and use. The product is a bit on the expensive side compared to other home Composters and users have complained it is not very durable. With the kitchen composter, you can have fertilizer in three hours. You can place it on the countertop to reduce kitchen scraps and create nutrient-rich soil for your herb garden and more. All you need to do is throw the waste inside it and push the go button. Once done, you remove the bucket and use the manure in the garden. The bucket is dishwasher safe, and the process is odorless. The unit fits in with any kitchen décor and is not an eyesore compared to backyard compost piles attracting flies. 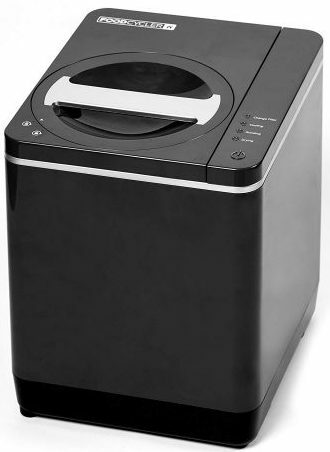 Here is another electric composter, you can use in the home. The Cara is easy to use and produces garden fertilizer in only three steps. You will have organic compost in three hours and needs no additives, draining or venting. You can place it close to a power outlet and leave it standing on the countertop. Whether you need a compost bin, tumbling fertilizer bin for the garden or even an electric kitchen composter you are in the right place. Using food, recycle bin in the home is ideal to start collecting scraps, but you still need a tumbling model to produce the final product. But if you are living by yourself or there are only three people in the home the electric compost machine can produce manure in three hours to add to your pot plants or the garden.